Television regularly fires the potent artillery of naked consumerism and crass materialism at the heart of the viewer. It does other things too. Some good, some bad. For me, the single redeeming feature of the "idiot box" is that it has given birth to the culture of tele-dramas. Of course, a lot of these tele-dramas are unadulterated trash, but sometimes we are treated to something special, a well-crafted story, things to ponder about and excellent portrayals. The mortar fire of ideologies that are essentially damaging to our way of life and the core of who we are, sadly, is something we as a people are often forced to suffer in order to gain access to these small mercies. Still, it was thanks to TV that people like Iranganie Serasinghe came to reside in our homes and hearts as the perennial mother of our collective imagination. Long before the arrival of TV, Iranganie touched another generation in the same way when she played the mother of the adorable little boy in Lester James Peiris path breaking film, Rekawa. Since then she has generously spread her exceptional talents in acting in innumerable plays, films and teledramas and in return has won the love and admiration of thousands of people. More than half a century has passed since she first went before the public. She has been interviewed, critically acclaimed and honoured with numerous awards. I asked myself, when I went to see her last week if there was anything new I could say about this enigmatic woman. As I write, I am still not sure if this is merely a repetitive exercise, a recycling of that which is already known. It was late evening when I walked into her garden in Nawala. She was in the veranda, listening to the birds who were probably anticipating the thunderstorm that was to hit the city a few minutes later. Before I could ask anything, she commented on the beauty of the Ehala tree in her garden and how one day she was walking home and was struck by the spectacle of the tree covered with flowers and standing against the backdrop of a splendidly coloured evening sky. Nature is clearly associated with healing for Iranganie. During the next two hours or so, she came back to this several times, expressing the longing she had for silence, and to be alone, enjoying the wonder of the natural world as she had long ago as a child. That "long ago" was located in Mudugamuwa, near Ruwanwella, where she lived near a tributary of the Kelani. She described softly and recreated images in a way that made the present and the place irrelevant. "I still remember vividly the silence that came with the sunset...the going down of the sun...the last bird call was that of the magpie. Then the kirivawlas would come out, followed by the mavawlas. There was only the sound of the river...the koravakka. It was perfectly peaceful. And from a distance the deliberate ringing sound of a blacksmith at work would be heard. It was not a disturbance. Among all this, the voice of someone reading from a bana potha." Against this history, it is easy to see why she despairs about the "here and now". "I used to think that at least we have our hills, but no, on every hill now there is a tower to facilitate the use of cellular phones!" Having founded an environmental organisation Ruk Rekaganno, which is now 25 years old and seen the violence done to our ecosystems over the years, and being acutely sensitive to political and social processes in general, it is not surprising that she says "at my age it is easier; if I had to think of the next 40-50 years, it would only bring despair!" She riled against "progress". "Developing what for whom? Just consider GMOs (genetically modified organisms). We are nothing but guinea pigs for the West!" She agreed that cynicism is not a good thing, but couldnt help remarking that today "we are in much greater trouble than we ever were". She was of the view that earlier it was a seen invader but now the enemy comes without a name and a form. Iranganie Serasinghe off-stage is certainly someone whose persona spills out of the frame of "mother" that we have got used to. I asked her to give me a brief biographical sketch, but she waved me off saying "thats boring, it has been written so many times." So I asked her about how she took up acting. "I have been told that I was acting from the time I was born!" she said. Apparently she had been taken for a concert nearby when she was small and had been enthralled by what she saw, so much so that she had come home and played out the parts that had caught her fancy. And her parents had got her to "perform" for friends and relatives who visited their home. During her tenure at Bishops College, Iranganie had taken part in end-of-term plays, and later, when she went to Kandy High School to do her "HSC" she had played Professor Higgins in Bernard Shaws "Pygmalion". She had qualified to enter the University, but her father, a Rate Mahattaya, who had been educated at Oxford, had objected strongly, saying "You are not going to that den of inequality!" Iranganies cousin who was already in campus had pleaded her case and the old man had relented. "The things I did in campus! I was a Marxist, having been influenced by relations who was Left-wing such as Esmond Wickremesinghe and my cousins even before I entered university. My father died in good time....when I was in my first year!" Needless to say, she was in the thick of the theatre scene in Colombo, coming under the guidance of Professor Ludowyk. In addition she had taken dancing classes under the tutelage of Chitrasena. After graduating with an Arts degree, Iranganie had got married and had gone to London. Ludowyk had given letters of introduction which allowed her to meet Flora Robson and Sybil Thorndyke, two great actresses. Through them she had spent a year at the Bristol Old Vic Theatre School and two years at the London School of Speech Training and Dramatic Art. When she returned home, the Ludowyks had got down director Neuman Jubal, an Austrian Jew who had fled from the Nazis to Australia. Iranganie claims that she learnt a lot from Jubal. "He gave a whole flavour to the stage. It was a romantic period for the theatre. No one ever thought of making money. There was tremendous discipline. We learned to revere the stage. I still have that discipline." Iranganie has been so much a theatre person that it is quite likely that many people dont know that she has lived other lives as well. She taught briefly at Musaeus College, worked at the Times of Ceylon after returning from London, married again, did a stint at the SLBC and finally took to the tourist trade, working as a junior executive at Mackwoods. "I never worked in one place for more than 4 years. I know that some people value a lifetimes work in one institution or at one job, but I think that jumping from job to job allows you to obtain a more comprehensive view of the world, meet different people in different fields etc. It is enriching." It goes without saying that theatre is Iranganie Serasinghes greatest love, although she says that she never thought of it as a career. "I wanted to have a home and a family," she said. It was all English plays until Henry Jayasena got her involved in "Apata Puthe Magak Nethe". This was followed by Damma Jagodas Sinhala version of Street Car Named Desire, "Ves Muhunu," and then "Porisadaya". 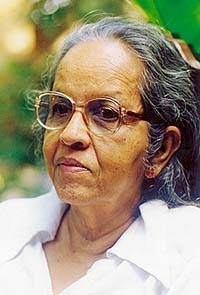 Her first role on film was a short piece by Lester James Peiris for the Traffic Police. This was followed by Rekawa. "Rekawa was a landmark in Sinhala cinema. It was the first film that was shot on location. Even the sound was recorded outside!" She also remembered Sandeshaya and Delovak Athara, both by Lester, and Bakmaha Deege by Dayananda. Unfortunately, according to Iranganie, it is no longer possible to do only good films. "We just cant afford it!" Still, she was particularly happy about her role as a teacher and mother of a soldier in the award winning tele-film, "Samapthaya" directed by Satyajit Maitipe. The story is set in a time of rebellion similar to the Bheeshanaya period in the late eighties. A short film, "Samapthaya" according to Iranganie captures a wide range of issues that ordinary people have to deal with in such periods of social upheaval such as loss, grief, anger, and other things that are hard to come to terms with. I put it to her that such a time is going to come again, and she said slowly, "yes...yes...yes". Those who are cricket fans would have seen shorts of "Kinihiriya Mal" in a commercial that was played in between overs during the recently concluded tournament in Sharjah. Iranganie plays the role of what she calls "a brothel keeper of the worst order". "I am bound to get a lot of criticism and people will be dismayed, especially since I smoke in the film. I am only worried that I might come off as someone advocating smoking, because I am against it. Still, I am fed up with the amma role. People have come to think that I cant do anything else." She also mentioned a new film by Sunil Ariyaratne, "Sudu Sevanella" where she is once again a rural character. "This is the first time I am playing such a role since Rekawa and I felt very much at home, much more comfortable than the middle-class ladies I have been portraying all this time." In the back and forth between work and world view, the things she slipped in her frustration at being a woman. I would love to take a tent and camp, but a woman cannot do that. And wherever I go, there are people who recognise me. It is either that or it is impossible to find a place where one can have some peace. When I was in school my favourite pastime was dreaming. In fact, my end of term reports were full of complaints regarding this, where my parents were informed that I would do much better if I dont dream and write poetry." Dreaming is something that she still indulges in apparently. I asked her if she still considers herself a Marxist and she said that although she identifies with the values and vision, human nature is too steeped in "thanha" for such a vision to become a reality. She used the word "thanha" so many times, that I told her "I knew a Malaysian who said that his father was a Maoist who had become a Taoist," and asked her "Are you a Marxist who has become a Buddhist?" She laughed and said that she doesnt like to put a label to what she believes because then you have to accept under that name. "Take for instance the matter of offering flowers. I can understand the charm of offering a single flower at the temple. But people seem to think that the more flowers you offer the greater the merit or the quicker the journey to enlightenment. So they steal flowers, not considering for a moment all the organisms that are killed in the process. And for what? If you want to venerate the Buddha, follow what he says!" She is probably one of the busiest women of her age, but the couple of hours spent in her company were infused with the soothing aura that one can expect only from those who are near and dear. Iranganie Serasinghe, history has so decreed, possibly against her wishes, will always be "amma" to those who have come to enjoy her soft intrusions into their lives. And like any mother, she is both life-giving and nurturing. We are not worthy, I am tempted to say.